Today, 21st September, 2018, is the International Day of Peace. We are in an age of recognition and appreciation for those who have shaped who we are today, and quite rightly so. There are some truly remarkable people from our history that children should be made aware of, fascinated by and most of all, inspired by. 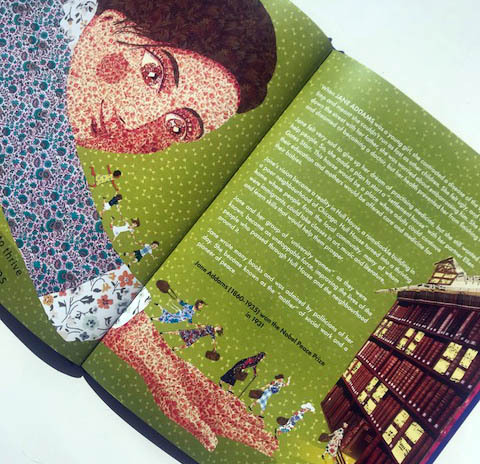 Peace and Me written by Ali Winter, illustrated by Mikaël El Fathi and published by Lantana Publishing is a superb, quality collection of short tales based on the lives of Nobel Peace Prize Laureates of the 20th and 21st centuries. What a gorgeous trailer created by Mikaël. Peace and Me takes us on a journey through the achievements of 12 Nobel Peace Prize Laureates from around the World including Jane Addams, Desmond Tutu, Shirin Ebadi, Mother Teresa and Martin Luther King Jr. This child friendly introduction to a group of inspirational males and females throughout history is engaging and visually beautiful. 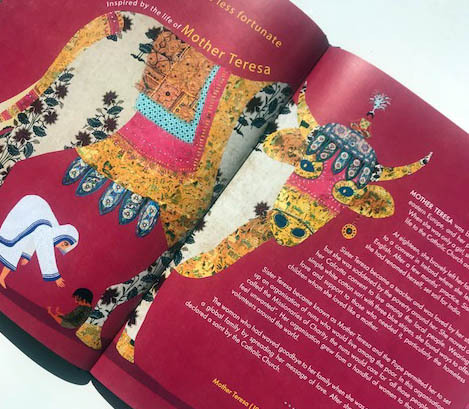 Each story is clearly and concisely written by Ali to give children a great overview of the person’s contribution to the peace efforts, education, equality and much more. We see human nature at its best, we also see how people can succeed facing adversity and prejudice. 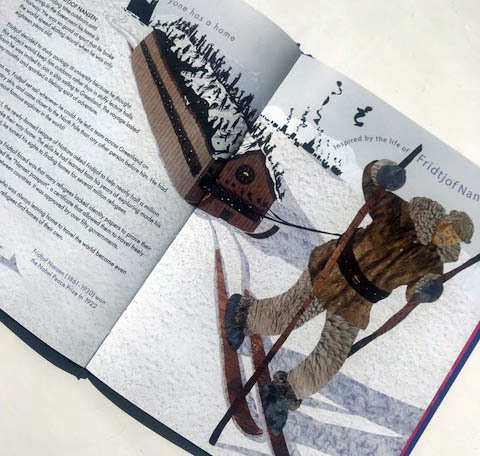 Mikaël’s illustrations are fascinating textured pieces of artwork in a collage style, with each page designed to reflect its Laureate through carefully chosen colours and graphics. It’s absolutely stunning to look at. This is an ideal school library book, filled with educational people that are often covered in school topics, and many more who are never even touched upon. This book gives children a broad experience of amazing people in our history. It’s an ideal launchpad into writing, drama and artwork in schools. The poem at the end, ‘Peace is…’ is a really nice touch and the perfect lead on into children’s own creative writing and follow-up discussions on what peace means to them. For many of us fortunate enough to grow up in a country without repression books like this can help us empathise with people who have either in history or in the present, but also teach us to appreciate our own freedoms given to us thanks to people such as these twelve peace laureates. 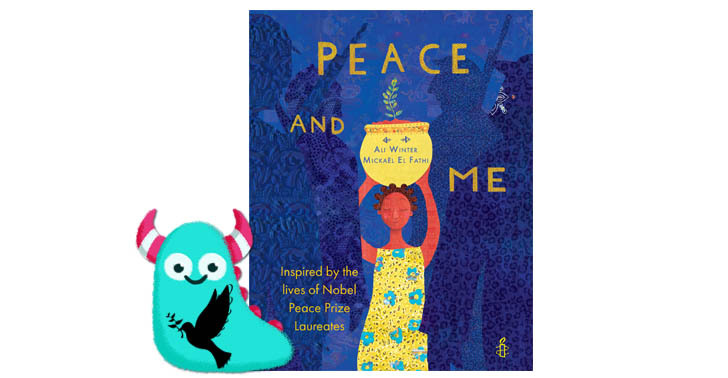 Peace and Me is another superb title brought to us from Lantana Publishing, which promotes and celebrates diversity, courage and strength packaged in this beautiful and unique book. It looks at the very best of humans in an accessible picture book format which both adults and children can learn from. I’ve said this before, but it’s always worth repeating, fiction stories are wonderful, escapism filled with fantasy worlds, but sometimes real life, history and true human endeavours can be equally, if not more incredible. Peace and Me is a beautiful and heartfelt demonstration of the power of such people. Peace and Me is available to buy and borrow from today from all good book shops and libraries. Thank you to Lantana Publishing for sending me a copy of Peace and Me and for allowing me to premier the trailer. And thank you for reading this peaceful Book Monster review.